1.Let pesto stand at room temperature 15 minutes. Meanwhile, alternately thread olives, cheese, salami and tomatoes onto skewers, repeating to include 2 of each ingredient per skewer. Arrange skewers on serving platter; serve with pesto for dipping. 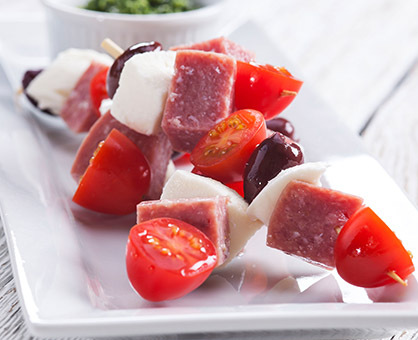 If thin slices of Genoa salami are available, roll or fold slices then skewer.